Gustafsson is probably best known as the saxophonist for the trio The Thing, which blends a free jazz methodology descended straight from Albert Ayler‘s Spiritual Unity with a willingness to import tunes from the world of indie rock—they’ve covered PJ Harvey, the White Stripes, Lightning Bolt, and many others, and released an album in 2012 backing vocalist Neneh Cherry. He’s also a longtime associate of and collaborator with Peter Brötzmann; the two share a love for the drumming of Paal Nilssen-Love, who’s recorded with each of them (separately and together) many times. Stetson, on the other hand, comes out of rock and moves toward jazz: He’s recorded extensively as a sideman with indie acts like Arcade Fire, Bon Iver, Feist, and TV On the Radio, as well as Jolie Holland and Tom Waits. But he’s also played with Anthony Braxton, and released two highly regarded discs of solo saxophone work, New History Warfare Volumes 1 and 2. This short album (four tracks, less than 35 minutes) begins with a series of low rumbles and roars, punctuated by the sounds of popping valves and the occasional vocal interjection which is nonetheless still pushed through the horn. It sounds like a dinosaurs’ mating dance, long deep notes from bass and baritone saxophones vibrating the listener’s skull-bones (if headphones are being employed) and/or rib cage (if the speakers are of a decent size). Despite it being a live recording, the sound is extraordinarily close and clear, the stereo field wide enough that it feels like Stetson and Gustafsson are perched on either of the listener’s shoulders, barking and growling in each ear. The music doesn’t maintain its obsession with low-end tones throughout; the men also play alto (Stetson) and tenor (Gustafsson) at times, though clearly the big horns are the attraction for performers and audience alike, offering as they do a physicality that the more conventionally “jazzy” horns can’t match. 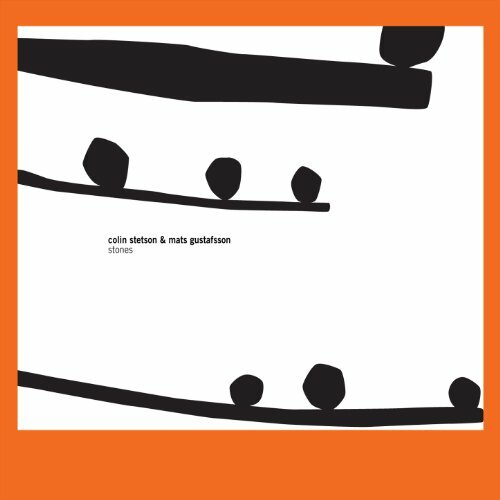 Saxophone duo albums are rare enough that comparisons are difficult—indeed, one of the records Stones most recalls only features one horn: Peter Brötzmann‘s disc of duos with bassist Bill Laswell, Low Life. Another point of reference, though, might be the early work of Borbetomagus, particularly on albums like Work On What Has Been Spoiled and Zurich, where the saxophones of Jim Sauter and Don Dietrich could still be clearly heard making horn-like noises, before they began swaddling them in layers of electronic effects. But ultimately Stones is unique, not only in the Gustafsson and Stetson discographies, but in out jazz generally. It’s also tremendously affecting, and genuinely beautiful, and well worth any adventurous listener’s time.